mom said it is to early to hire a party planner. My birthday is May 27 and Lily's birthday is May 21. Isn't that crazy since I was adopted from another state. We will be a big three, 3, trois. Ironically, today is 3, May 3. At least I am allowed to wear my hat around. I am going to go do some planning. You look so cute in your hats!!! I think this calls for a huge party! And you know what? My Adopt-an-Ammy Day is coming up this month, too. We should party together! ...only I won't wear the hat. Seriously. Nice Birthday hats. I bet you are getting excited about the big day. Nice hats! It's fun to plan for parties! Could you send me your snail mail address? My email in on my bloggie. If you don't want to that's ok too! I can't imagine all the crazy things you'll be able to do for your birthday! You guys would be awesome party planners. Oooh! I love a good party! Can I come?!? (Although I'm not super keen on party hats - Mom tried to put one on me last year for my birthday, and well, let's just say that it took a lot of bribes for her to be able to get one halfway okay picture...) You guys, however, look mah-velous! You are adorable in your hats. Whatever birthday plans you make, your birthday party is sure to be wonderful. Hey there Ben and Lil, my barkday is in 3 days! We hope you two have fun planning awesome party. You two look cool with the party hats. So will there be one pawty or two or maybe three? BOl. You look like you are ready right now with your cute hats on. Nothing wrong with getting an early start - pawtying can be hard work, right? How exciting! Barkdays are the funnest! I know you 2 will come up with a perfect plan!!!! You need to find the phone # for your nearest 3 Dog Bakery and get that cake ordered!!! I think it is never to early to start planning a birthday party!! Oh You two's are cutes planning your Partys!!! Mine in May 19th! So no way is it's every too earlys!!! You are ons the rights tracks!! Starts your lists! Lots of presents, treats, day trips, massages, oh the list is endless friends!!! Your Hats are too Cutes!! party planners are very important for things like this! DEE TAILS to tend to. Favors R Foodables U Snacks L Pressies E Decorations S Cards and of course... GAMES. A third birthday is a milestone. Why in people years, isn't that about age 21? Woo-hoo! I think this calls for an all out shindig!! Birthdays are for partying!!! Have fun planning!! Too early! How is this too early for an end of May party. You're doing to need caterers, a DJ at least, unless you're going for a live band, invitations, decorations...oooh, the list is endless. Maybe Twix could help out. She's very much the hostess with the mostest. We just know the two of you will have the biggest most fun birthday pawties ever! It's never too early to start planning for a birthday! And to answer a couple of your questions: yes, we looove salad and most things edible and sometimes not so edible, and we are exhausted when we come back from the barn. We usually sleep until midnight, with some welcome food interruptions and then we wake up to dance/play/hop on our mommy. Isn't she the luckiest mommy on earth? 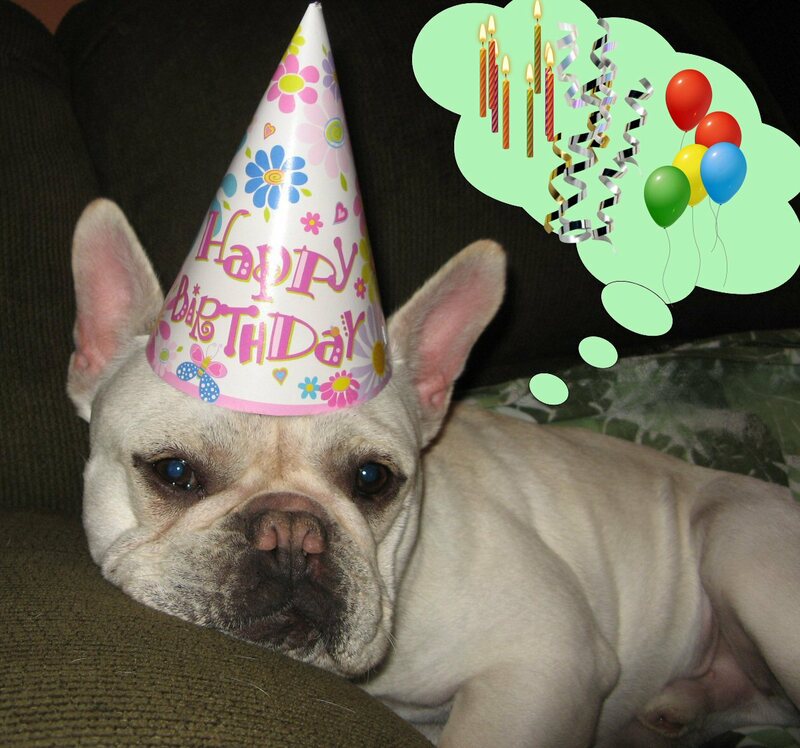 Never is to early to plan a pawesome Birthday party! there will be a celebration coming, and its already being planned. Oh my goodness! What a huge milestone! Can't wait to see pics of the big event. Seems like it's going to be so much fun already. I love your party hats! You two are so adorable! We can hardly wait! Do you think you'll have 3 parties too - it would be appropriate for pups becoming 3 years old. I love your party hats! Have lots of fun planning! I hope my mom throws me a birfday party too in June.